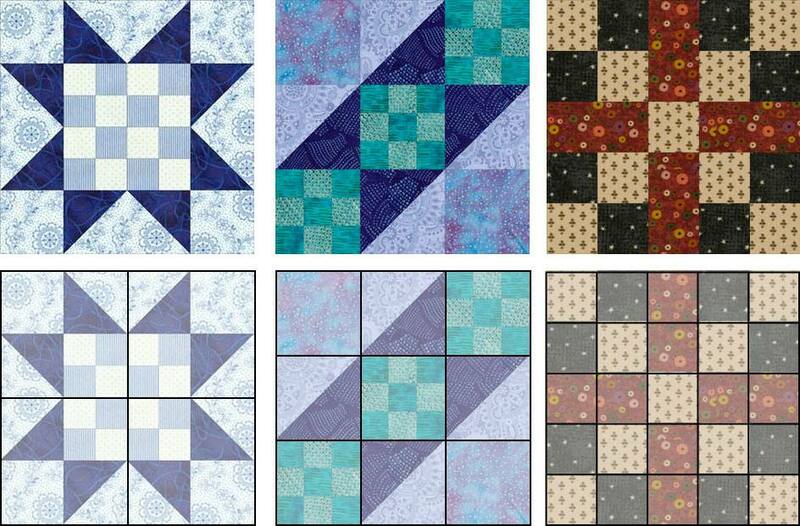 It's easy to change the size of most quilt blocks once you understand patchwork quilt block structure. I'll explain a few of the most critical points here, but recommend that beginning quilters read a detailed description of patchwork basics before scaling a block up or down. A four-patch quilt block is made up of four square grids, two across and two down (left illustration). A nine-patch quilt block is made up of nine-square grids, three across and three down (middle illustration). Five-patch (right illustration) and seven-patch (not shown) quilt blocks are a bit different because their names describe how many square grids exist in a single row across or down, not the total number of grids in the quilt block. Four-patch and nine-patch quilt blocks are routinely sub-divided to create more intricate patterns, but once you become a block watcher it will be easy to identify their underlying structure. Five-patch and seven-patch block grids can be sub-divided into multiple patch units, but that isn't quite as common, other than the use of half-square triangles because the grids are usually a bit small already. Keep in mind that individual grids in a quilt block are sometimes combined, rather than subdivided, like the areas created by red strips in the five-patch block above right. Why should you care about quilt block structure? Once you can decipher a quilt block's grids, you can make it larger or smaller with ease. And although structure is important for altering the size of a quilt block, it's also a huge component when designing a quilt, because some blocks just don't 'mesh' when sewn side-by-side, even if they're the same size. You'll learn more about that in my patchwork structure tutorial. Always make a test block in the new size before cutting all of your fabric. Some quilt blocks are easier to scale using different techniques. An eight-pointed star made with diamonds (versus the 'cheater' version with half-square triangle units) and some blocks with curved patches (which are sometimes more difficult to draw correctly) are two examples. If you find a block that isn't easy to alter using the methods in this tutorial, make a photocopy, enlarging or reducing the block to the finished size you wish to sew. Measure the sizes of its patches (remembering that the dimensions are unfinished). Use templates to construct the block or refer to my patchwork shape cutting instructions to choose a patch and block size that can be easily rotary cut (remember that all shape sizes must be altered in the same way). Patchwork quilt blocks (and other quilt components) are typically sewn together using a 1/4" seam allowance (I've seen people assemble miniature quilts with a 1/8" seam, but I do not recommend the method). Foundation pieced blocks (sometimes called paper pieced blocks) are not sewn with precise seams allowances). Patterns nearly always list sizes you must cut, not finished sizes. I used the word nearly, just in case someone out there is giving finished sizes in cutting instructions. If you encounter that, I suggest you steer clear of the pattern, unless it is for applique. For patchwork with straight sides (90-degree angles from each other), such as squares, rectangles, and bars, you'll add 1/4" to each unfinished dimension to determine the correct cutting (unfinished) size (or a total of 1/2" to the length and width. a 3" x 3" finished square would be cut 3-1/2" x 3-1/2"
a 2" x 4" finished rectangle would be cut 2-1/2" x 4-1/2"
The amount added to the finished sizes of patchwork pieces with angled edges (such as triangles and diamonds) varies, depending on the shape, but you'll still sew these pieces to neighboring patches with a 1/4" seam allowance. It's easy to change a patchwork quilt block's finished size by altering the size of each grid in the block. Finished sizes of block grids needn't be in whole numbers. Use fractions if you like, as long as they are dimensions you can cut with a rotary cutter (if not, plan to construct your block with templates). When considering block size determine finished sizes first. Notice that squares do not have to finish in even numbers -- any number that is rotary cuttable will work just fine. There may be times you choose to make quilt blocks only from squares, but most of your blocks will be a bit more intricate, and sizing them up or down will require a few extra considerations. Let's look at the nine-patch block on the right. It's made up of nine grids, but only two of those grids are simple squares. Four are half-square triangle units and three are smaller nine-patch units. Always consider the grids containing the smallest patches when you choose a finished block size. Could the design be made into a 15" block that's rotary cuttable? The grids that hold small nine-patches would finish at 5" square in that scenario. Dividing 5" (the grid size) by 3 (the number of squares across and down in the small units) equals 1.66", a dimension that can't be cut accurately with a rotary ruler. But let's say you need a quilt block that finishes at about 15". Use 1-3/4" (finished) squares in those units instead of the 1.66" required for a 15" block. The result (1-3/4" x 3) would produce a 5-1/4" (finished) grid. Multiply 5-1/4" by three (to account for all grids in the block, which must be equal) and you'll have quilt blocks that finish at 15-3/4", a perfectly acceptable size unless the blocks must match 15" neighbors. How would you cut patchwork for a 15-3/4" finished quilt block? Four half-square triangle units: cut (2) 6-1/8" x 6-1/8" dark squares and the same number and size of light squares - cut in half once diagonally and sew contrasting squares together on their longest edges. Or leave the squares as-is and use a quick piecing method to sew the units. Two large squares: cut (2) 5-3/4" x 5-3/4" squares. Three small nine-patch units: cut (15) 2-1/4" x 2-1/4" dark squares and (12) 2-1/4" x 2-1/4" light squares (assuming you will not strip piece the small nine patch units). Four-patch quilt blocks have four primary grids, but the majority of blocks you'll encounter have been divided again to create an 8-grid structure. You already know how to enlarge or reduce a quilt block made with only squares of fabric, and changing the size of a more complex block is accomplished with the same methods we used for the nine-patch block on page 3. Let's practice with the blocks in the illustration. The bottom illustration of the Sawtooth Star quilt block shows the design's four-patch grid, and it's easy to visualize dividing the grids again horizontally and vertically, placing the star tips, block corners, and four small squares into grids of their own (4 grids across and 4 down). Would it be possible to make this block in a 12-inch finished size? Examine the smallest patches of the grids first, the little squares at the block's center. If you visualize the divided grid arrangement, you can see there are two small squares in each grid. 3" divided by 2 = 1-1/2" (finished) for each of the two small squares in a grid, a size that's rotary cuttable. If a finished size is rotary cuttable, the patch will still be rotary cuttable after adding the seam allowance. Would this block work in a 10" finished size? The half square triangle units and plain corner squares are doable for any rotary cuttable size, so a 10" block is one valid choice. Bonnie Scotsman can be assembled in a couple of ways. You can make units that look just like the four grids, but the block's patchwork will flow a bit better if you extend the long, light bars on the top and right edges to touch the dark corner square, rather than piecing them separately to create a four-patch unit. The grid not only helps you calculate sizes, it allows you to diagnose the block's structure. A huge percentage of our quilt blocks can be assembled in multiple ways, and examining grids lets you begin exploring the options. Take a look at a typical Bonnie Scotsman Quilt Block Pattern to see how I chose to make the block, and then jump to my Sew and Slice Bonnie Scotsman pattern, an even easier way to sew the blocks. Can You Guess How These Blocks Are Constructed? Sometimes a quilt block's type or grid structure isn't immediately apparent. Greek Cross, the quilt block in the upper left-hand corner of the illustration, is one of many blocks with an "unequal" design. It could be made into a five patch block if the narrow inner bar areas were exactly half the width of the outer half-square triangle corners, but many versions (like mine) use narrower bars in those center slots. Swamp Angel, upper right, has lots of angled patchwork, but look at it closely and you'll see that it's a pretty simple nine-patch arrangement. The Arizona quilt block, lower left, is another nine-patch quilt block. It's grids have been subdivided. Five Patch Chain, lower right, is a five-patch block with some subdivided grids. This tutorial is simply an introduction to quilt block structure. I tried to choose the types of blocks you'll encounter most frequently, but suggest that you begin to examine blocks carefully to practice determining their structure. Most people who email me about changing block sizes are working from an existing pattern, and that scenario makes it much easier to scale a block up or down. Use the drawings and photos supplied with the pattern to examine gridwork. Make sketches if it helps you visualize the block, and then calculate the patch sizes and add seam allowances. Sew a practice block from scraps of fabric to make sure your dimensions are correct.